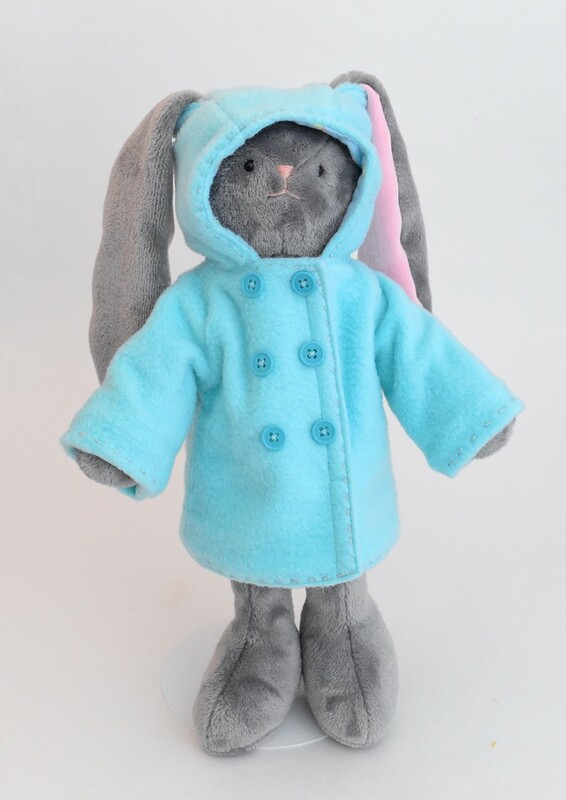 Circumference of the front of hood (framing face): 8"
Height of Bunny (top of head to toe): 15"
I picked a middle-weight fabric for the outer layer: neither too heavy as to have bulky seams nor too light as to feel flyaway. I used fleece. I think wool would also be awesome. Both are easy to work with. 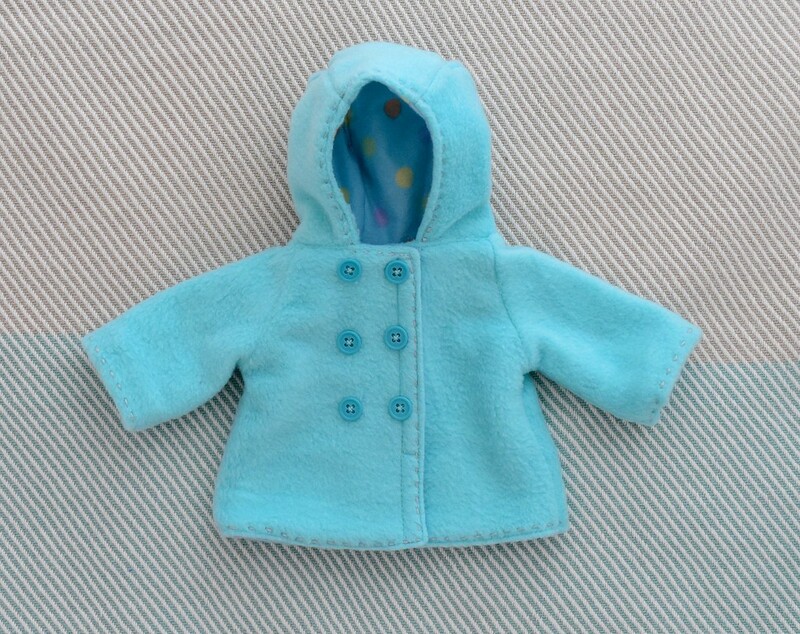 Although if you do want a lighter spring coat or even a raincoat, feel free to try a light-weight fabric. I used flannel and/or knit for the lining. 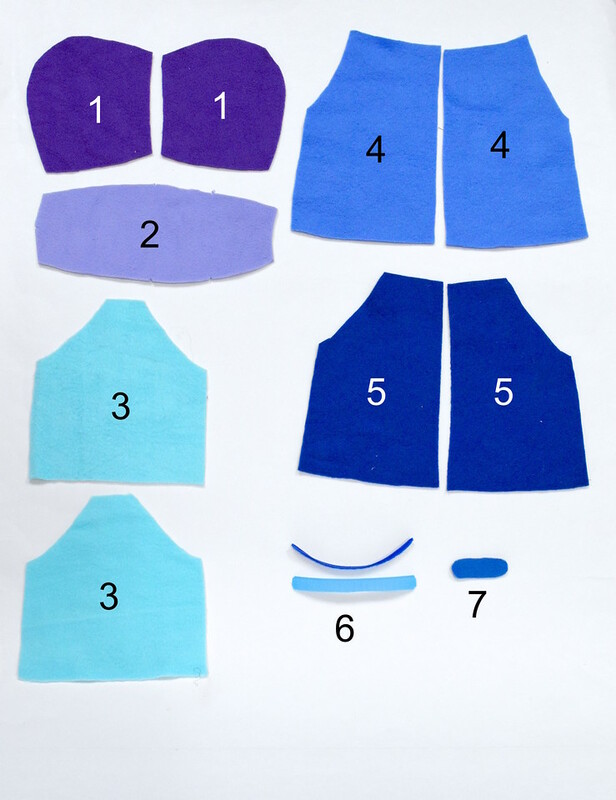 1/4" is probably sufficient for each layer (outer and lining). 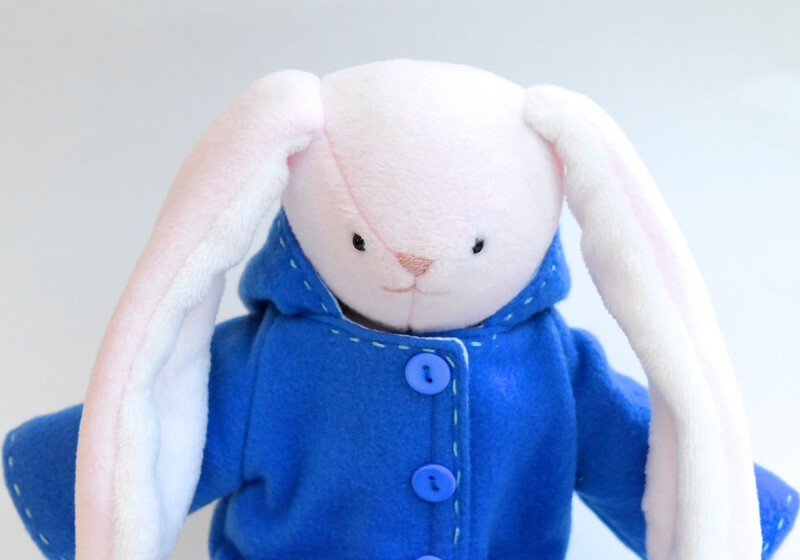 (i) without ear openings in the hood, the ears will not protrude and instead lie against the Bunny's body. 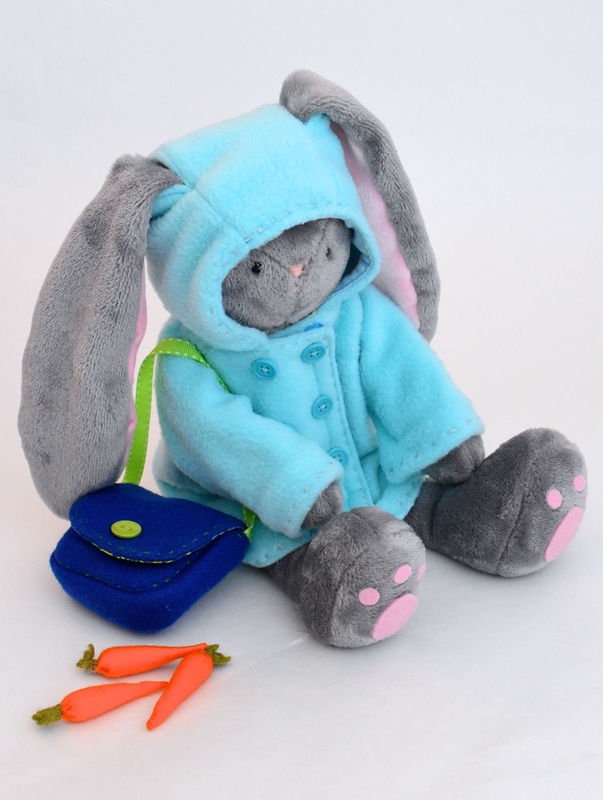 This makes the Bunny's body more bulky overall. 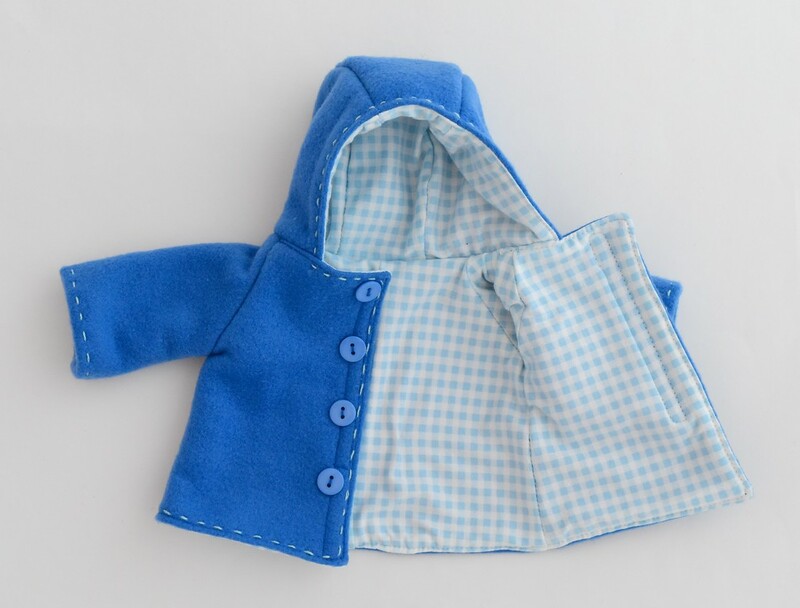 To allow for this, the coat fastens with less overlap (about 1/2") of the front button plackets. 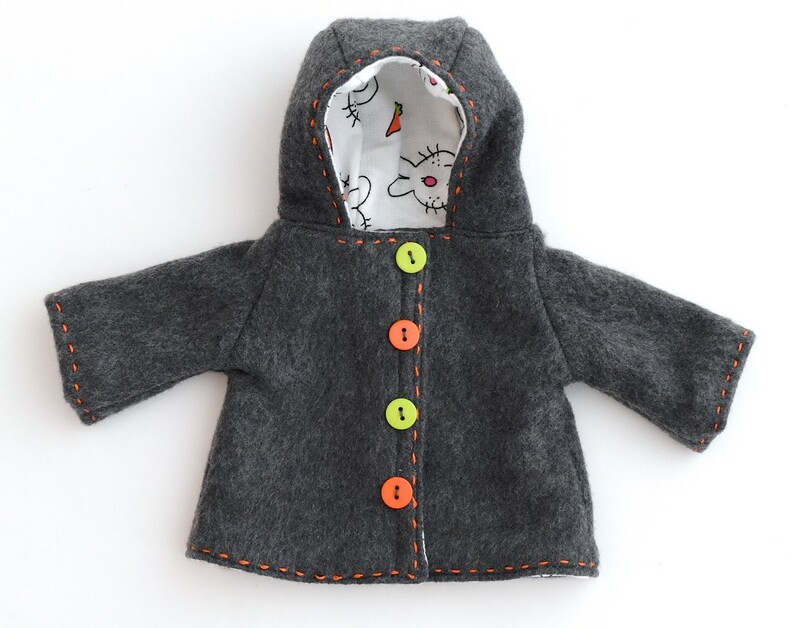 The buttons on this version are of the style of a single-breasted coat. 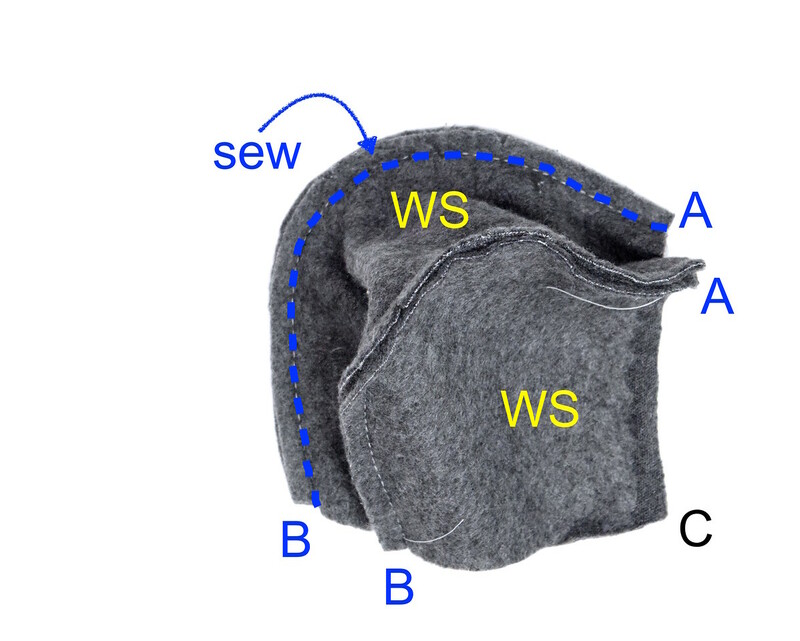 (ii) with ear openings in the hood, the ears can protrude outside the garment. 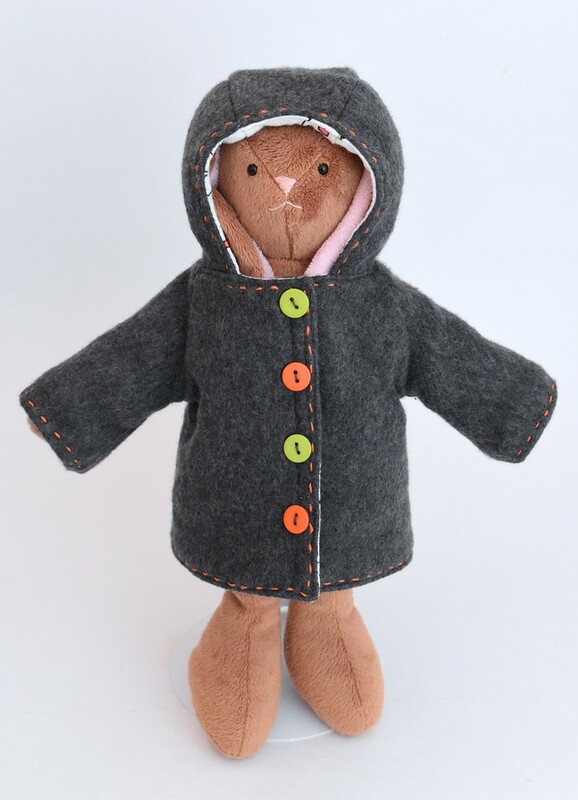 As a result, the Bunny's body takes up less volume within the coat and a wider overlap of the front button plackets (3/4" to 1", as preferred) gives a better fit. The buttons on this version are of the style of a double-breasted coat. 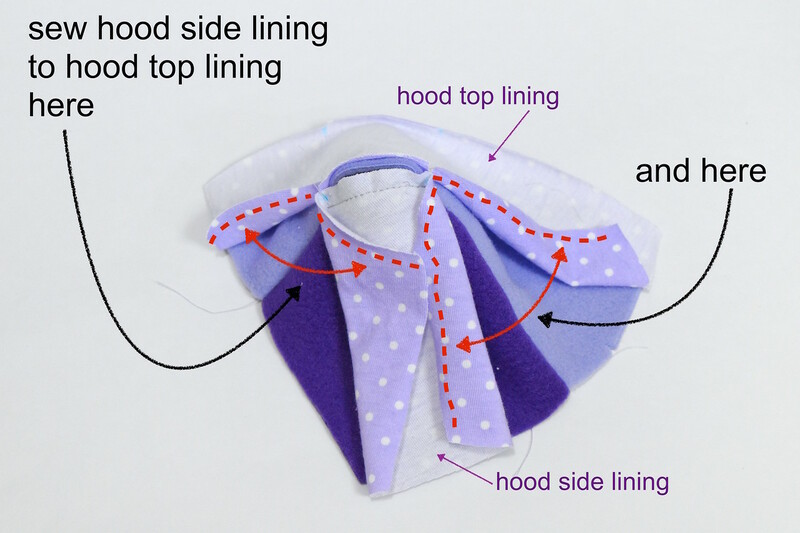 As the above photos illustrate, the tutorial demonstrates two hood styles. 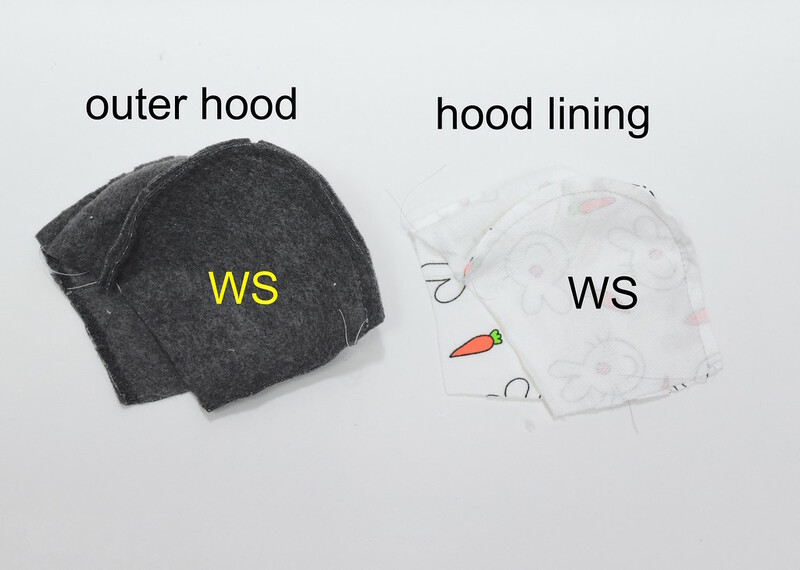 The hood itself is the same in both instances, but there are ear openings in one style and no openings in the other. Sewing the style with the ear openings is a substantially more involved process than the style without - you'll see this reflected in the relative number of steps and photos. 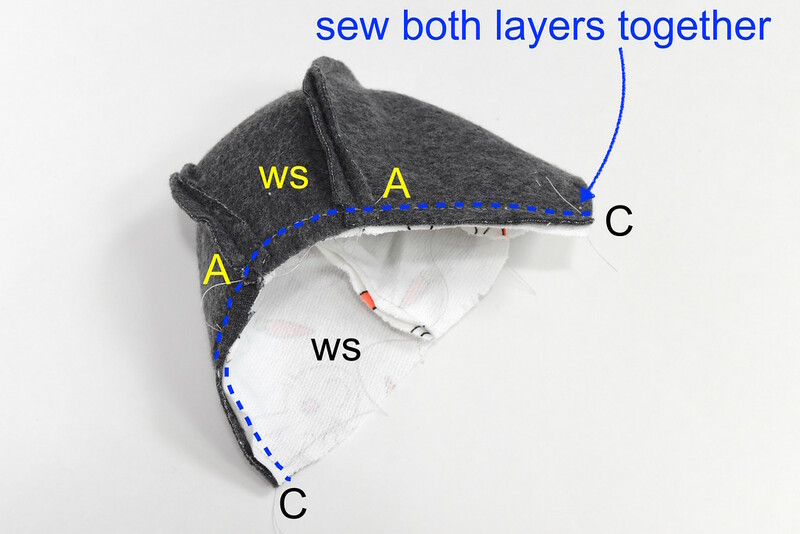 For a faster sew, pick the hood without the ear openings - visualizing it is more straightforward than the other version. I'm going to be honest: some parts of the construction process are going to make absolutely no sense. I can only imagine the bewildered looks on your faces as you peruse the photos and ask, "what on earth is she doing? What even is this bizarre twisted knot of fabric? How can this possibly be a garment?" But see: this is a fully-lined coat, with no exposed seam allowances. And sleeves with rolled cuffs. 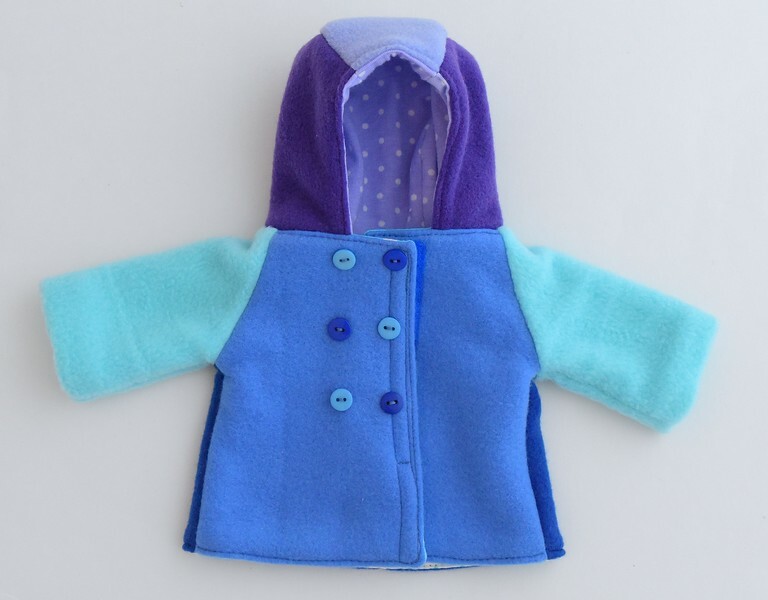 This may be a toy coat, but we're employing real dressmaking techniques to make it. Which sounds intimidating but I've used a color-blocked sample in the photoshoot to help you better visualize all the pieces and relative orientations. If you do it right, in that moment at the end when you turn everything RS out to behold a finished, fully-lined garment, I promise that you will be very proud of your own workmanship. It will feel like magic, even though it really is just tailoring acrobatics. 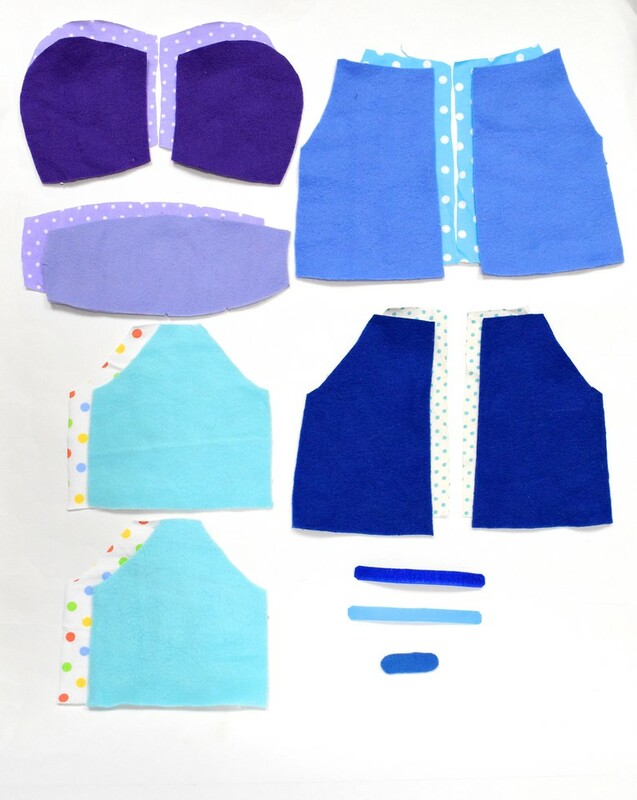 And imagine this: you can use this same technique and construction sequence to make real human-sized garments for yourself and your kids! So I adjure you: trust me, okay? It will be worth it. 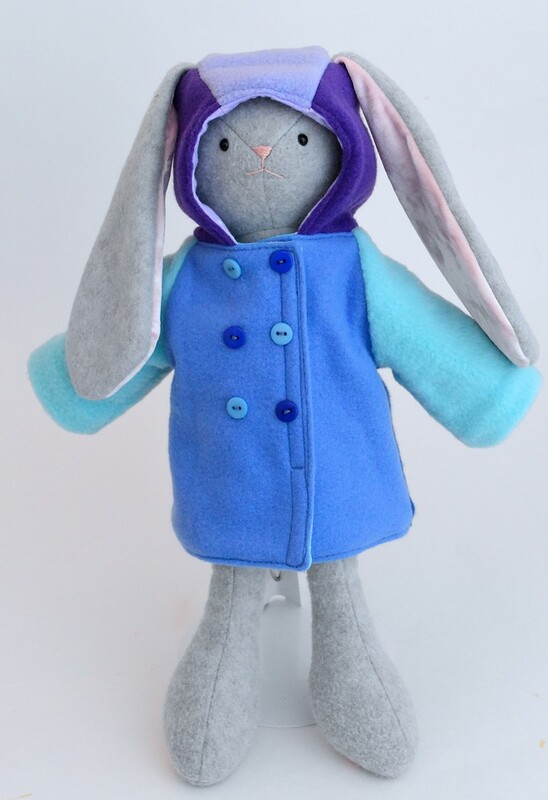 And now, let's make a coat! This post - Part One - will cover the two versions of the hood. 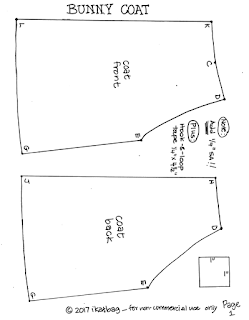 Part Two will cover the body of the coat (front, back, sleeves). Note: The templates have no seam allowances. 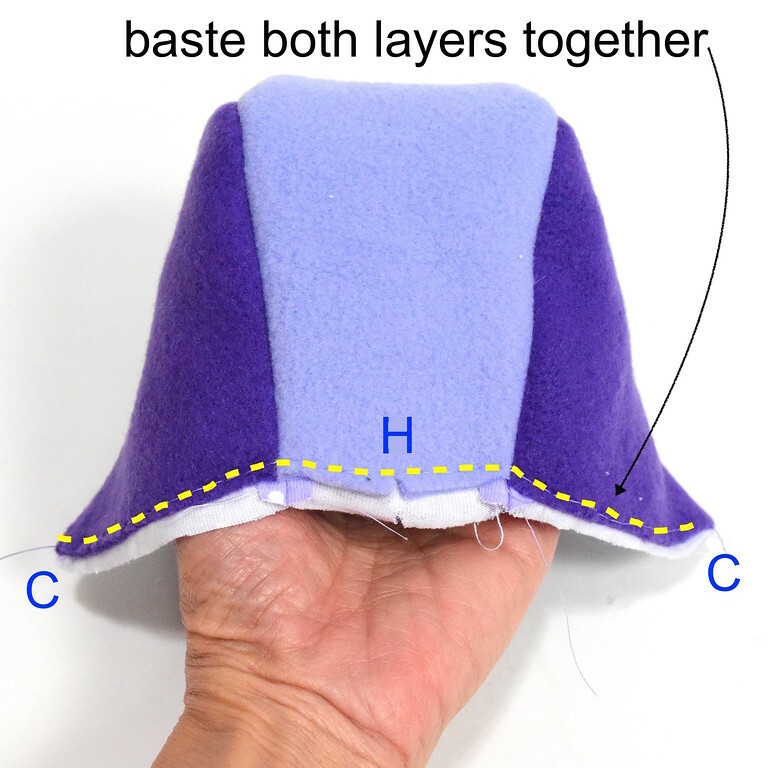 You must add your own SA (I recommend 1/4") around all edges EXCEPT for the midline of the sleeve, on whose template that edge is marked "place on the fold". 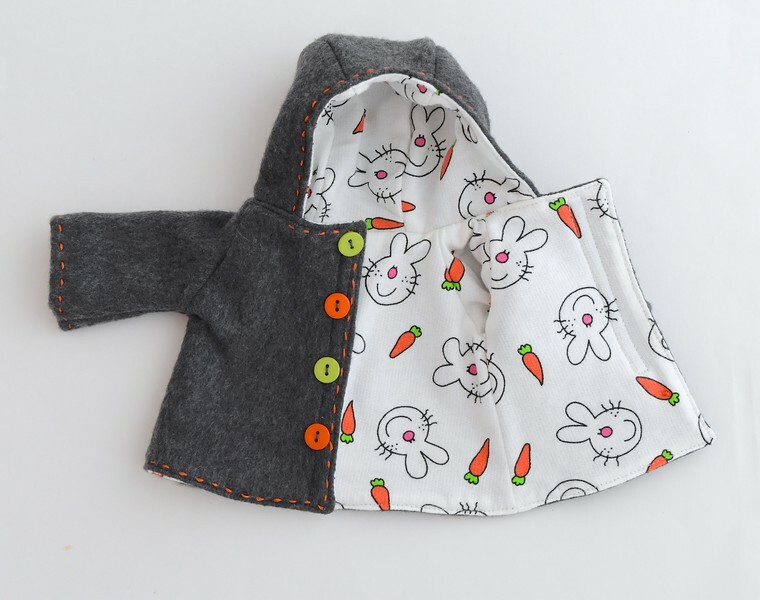 charcoal fleece for the outer layer, and this stinkin' cute bunny-and-carrot white french terry for the lining. Work with the outer pieces first. 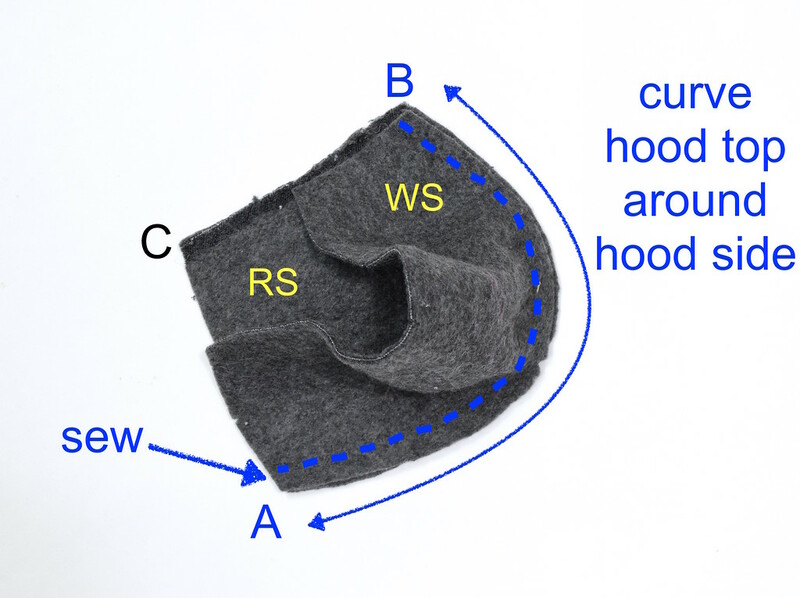 the long side of the hood top aligns with the curved edge of the hood side between A and B.
Sew from B to A to attach the hood top to the hood side. Step 2: Repeat Step 1 with the other hood side piece to attach it to the other edge of the hood top. Step 3: Repeat Steps 1 and 2 with the lining pieces to make an identical hood lining. Step 4: Turn the hood lining RS out. 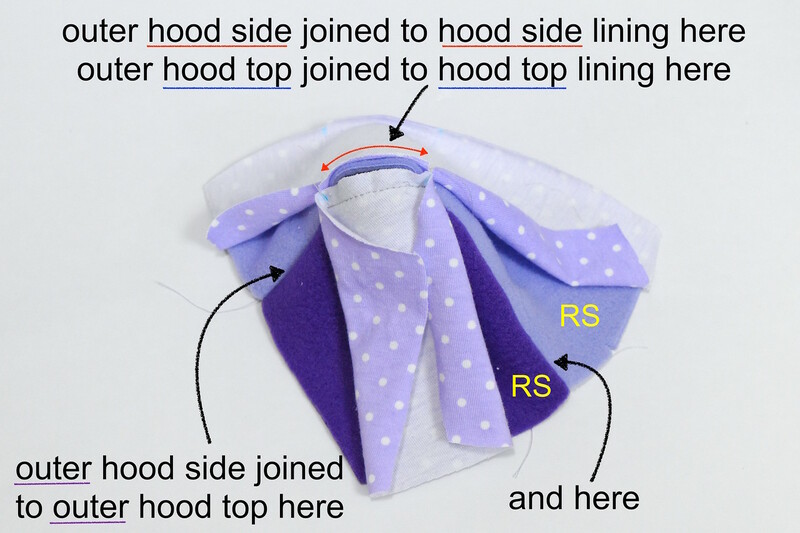 Place the RS of the outer hood and the hood lining together and align all sides and points. Sew from C through both A points and to the other C point (this is the edge of the hood that frames the face) to attach the layers together. 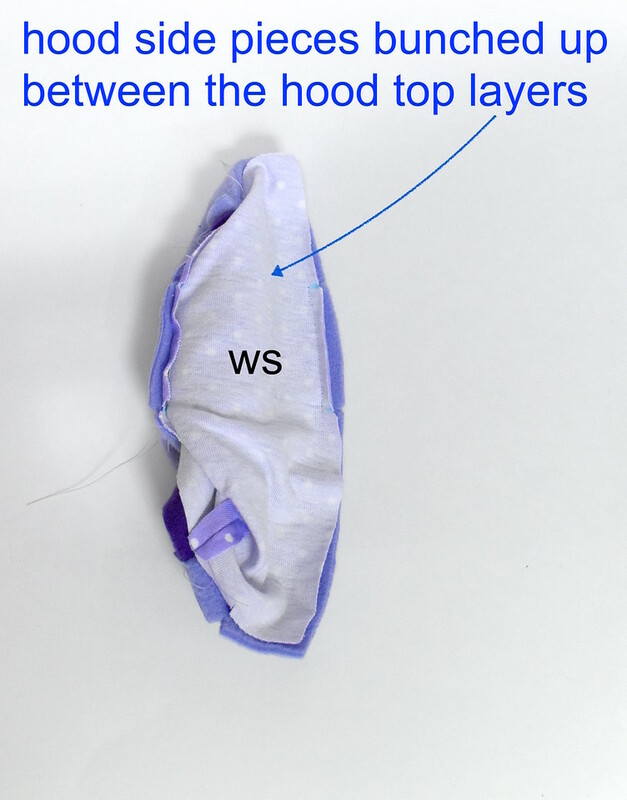 Step 5: Bring the WS of both layers together so that the hood is now RS-out. 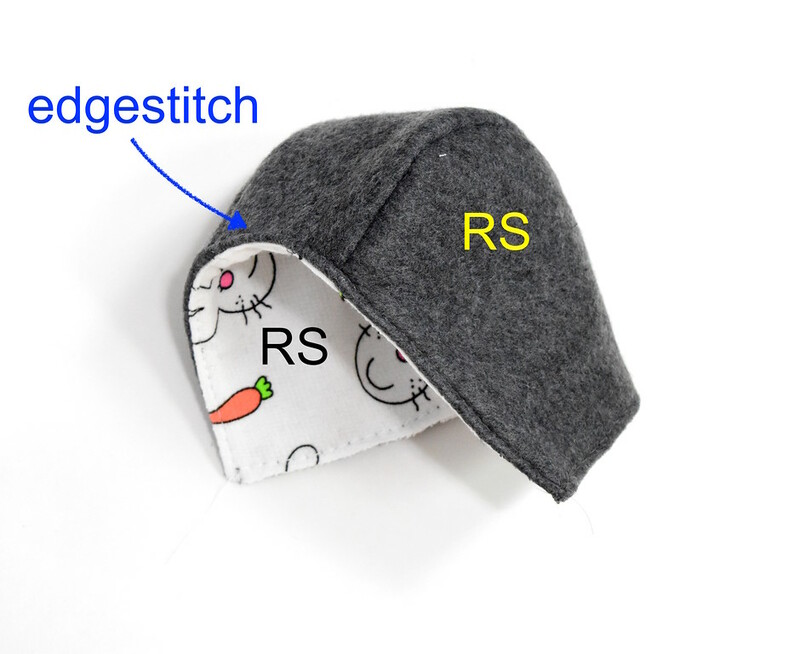 Edge-stitch on the RS of the outer hood along the edge that frames the face (i.e. CAAC). Step 6: Baste together the SA of the edge CHC (this is the edge of the hood that will be sewn to the neckline of the coat). The hood is finished. It is now ready to be attached to the coat body. 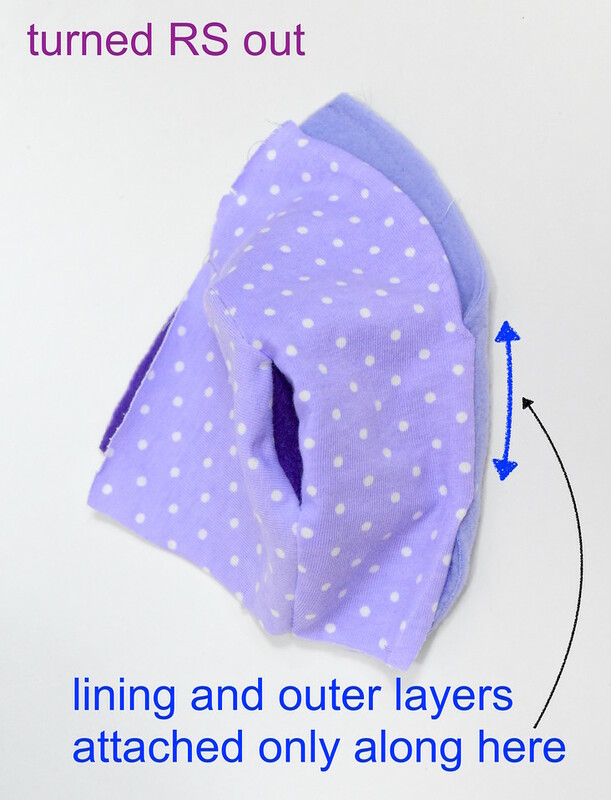 We're using the purple fabric combination in the earlier cutting layout photos for this hood. 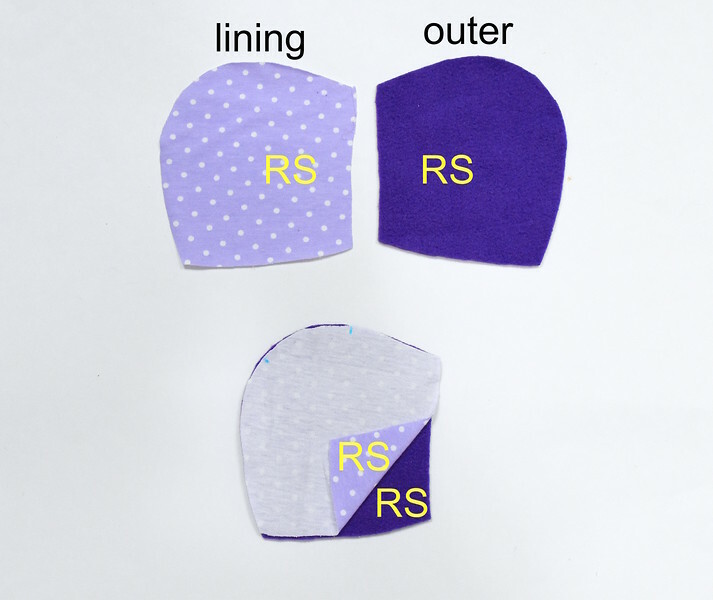 With RS together, match up each outer hood side piece with its corresponding and lining piece. Mark the positions of the ear openings on the WS. 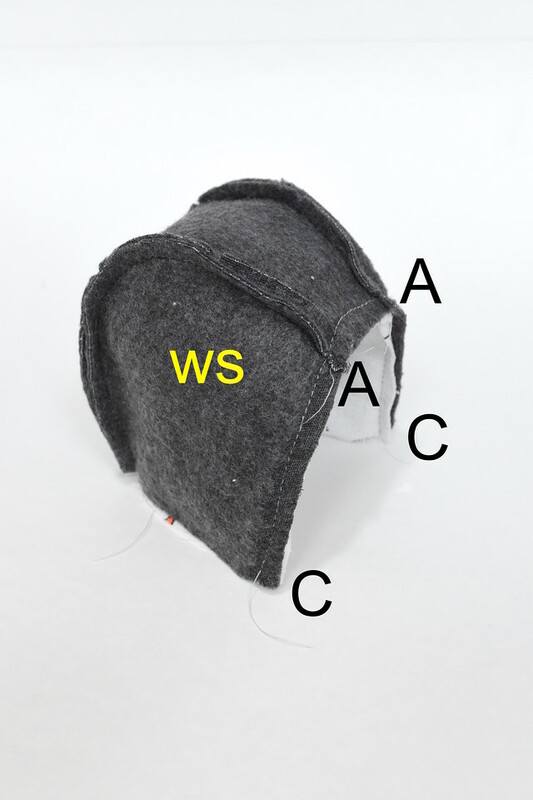 Place the RS of the hood top pieces together and mark the positions of the ear openings on the WS. 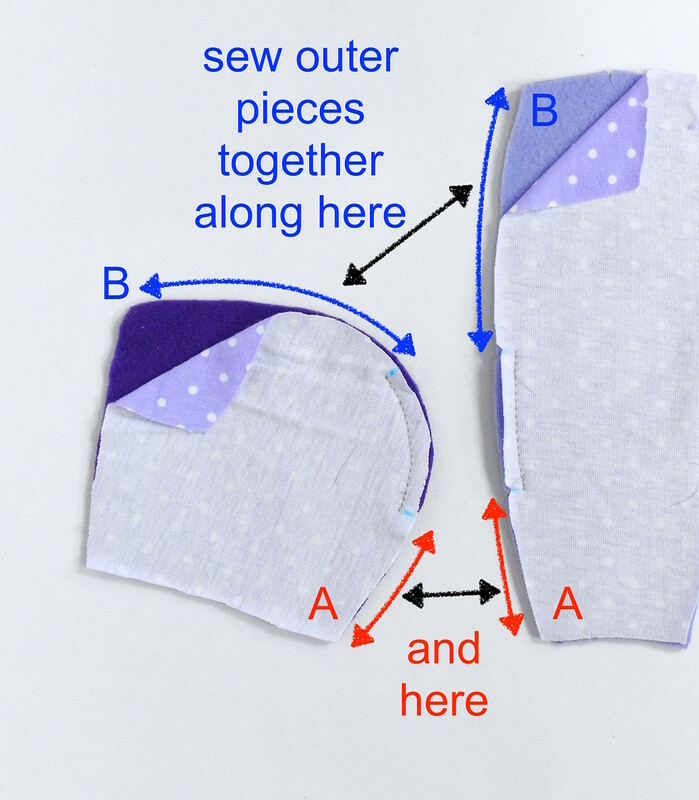 Between and on either side of those orange arrows, we'll be sewing the layers of fabric together in different paired combinations. This will be further explained in later photos. 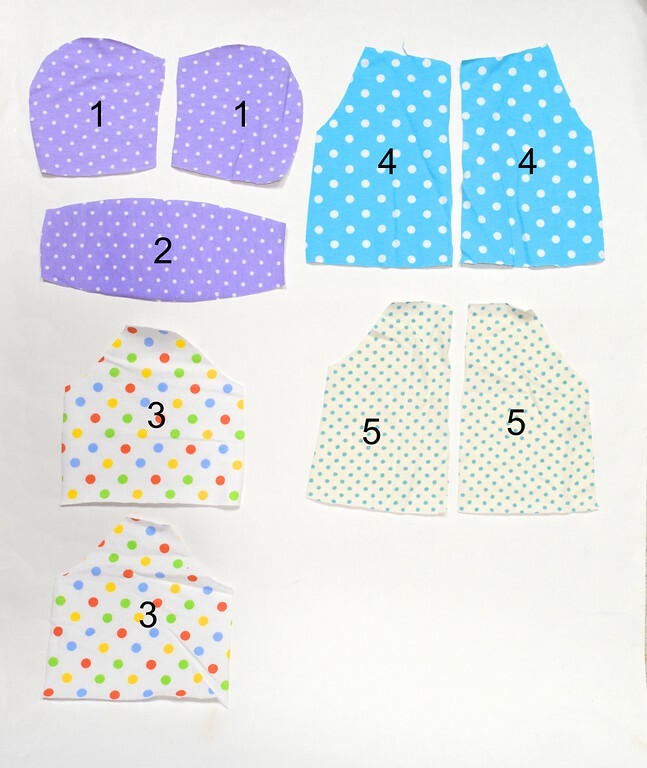 Step 1: Locate the pieces that resemble the ones shown in the photo below. 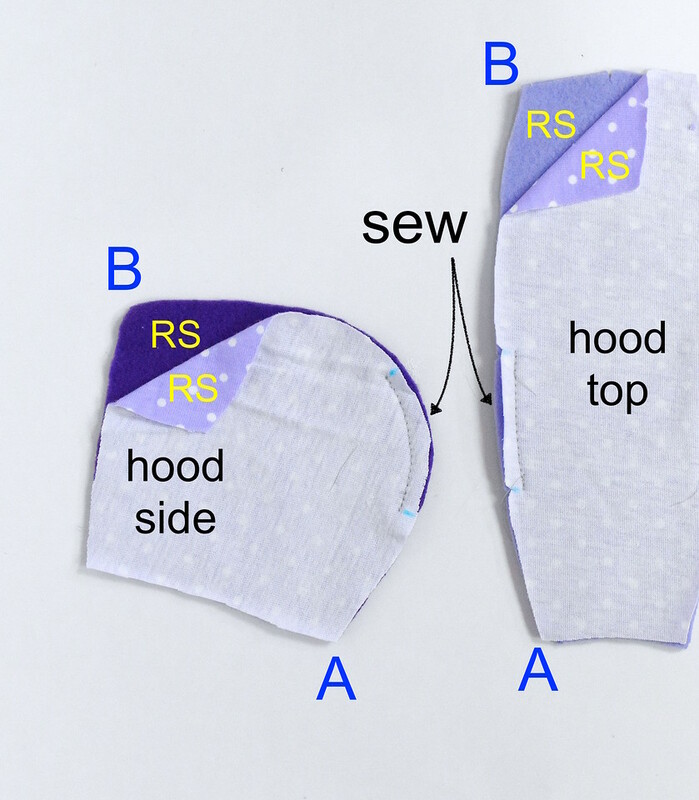 Working with the hood side pair first - with RS together, sew the OUTER and LINING layers together only between the ear opening location marks. 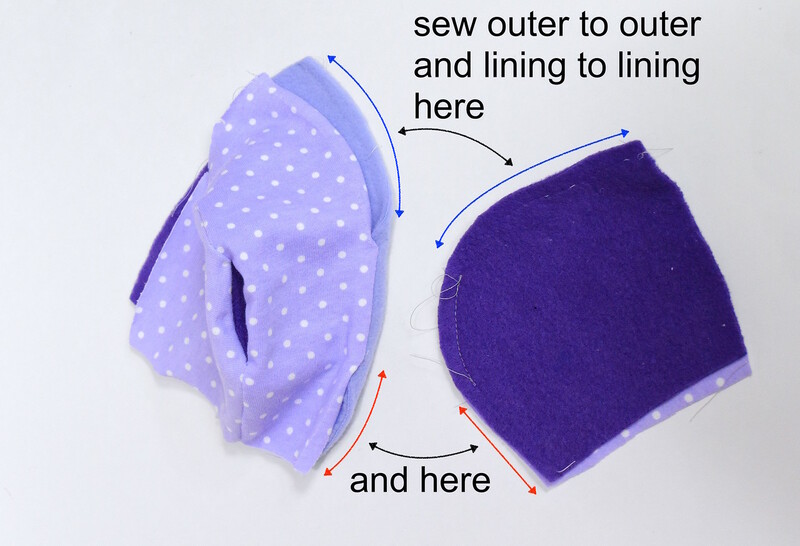 Work with the hood top pair next - with RS together, sew the OUTER and LINING layers together only between the ear opening location marks. Remember to backstitch! Step 2: We will next connect the hood side to the hood top, one layer at a time. Work with the OUTER layer first. With RS together, match up point B on the hood top with point B on the hood side. 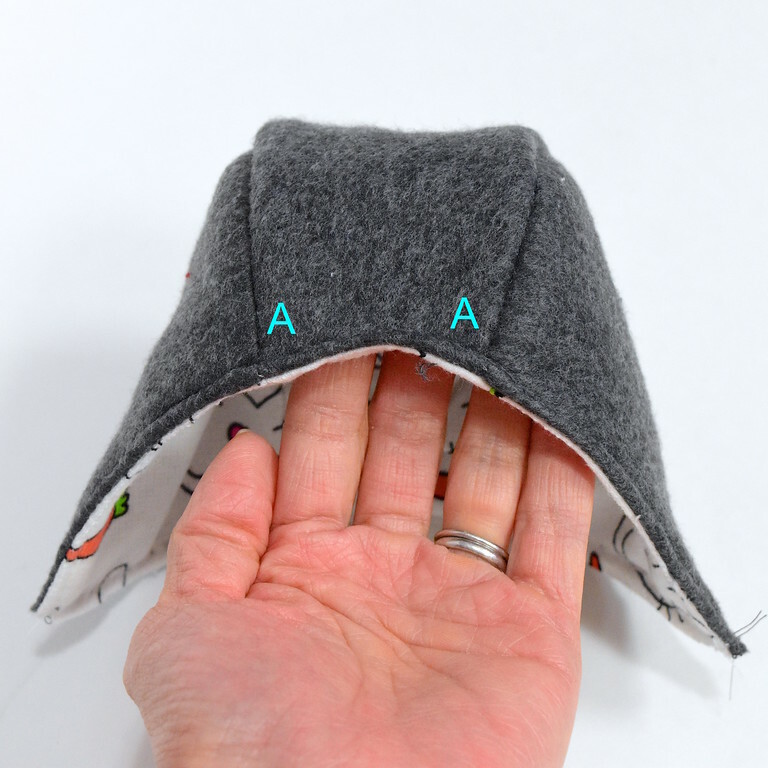 Sew through both layers, from point B toward the ear opening seam you sewed in Step 1. Stop when you reach the ear opening seam. This corresponds to the section shown with the blue double-ended arrows. Still working with the OUTER layer, with RS together, match up point A on the hood top with point A on the hood side. 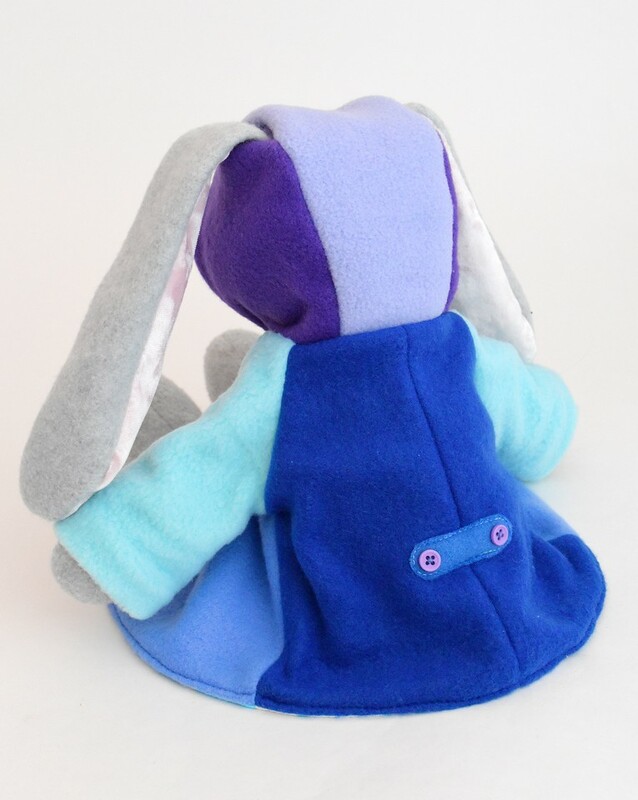 Sew through both layers, from point A toward the ear opening seam you sewed in Step 1. Stop when you reach the ear opening seam. This corresponds to the section shown with the red double-ended arrows. 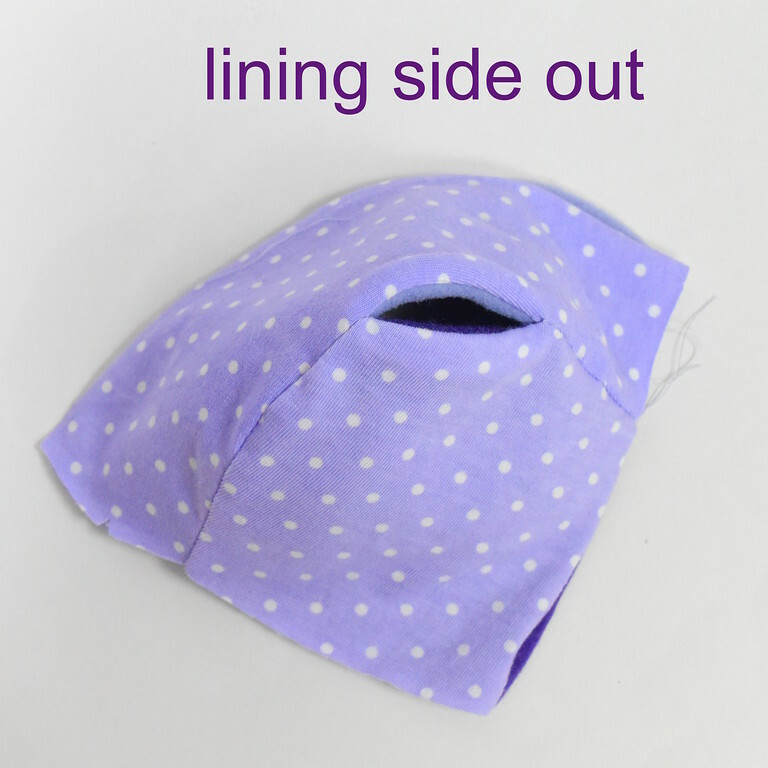 the outer hood side is joined to the hood side lining in the region of the ear opening. 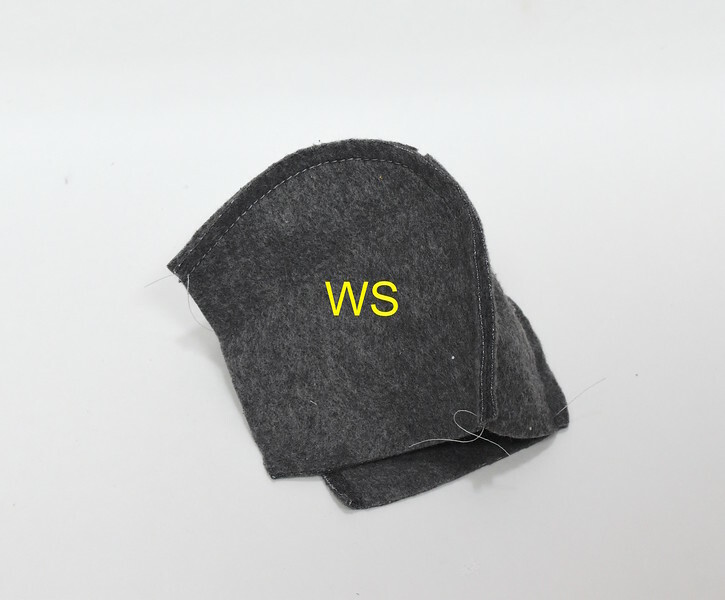 the outer hood top is joined to the hood top lining in the region of the ear opening. 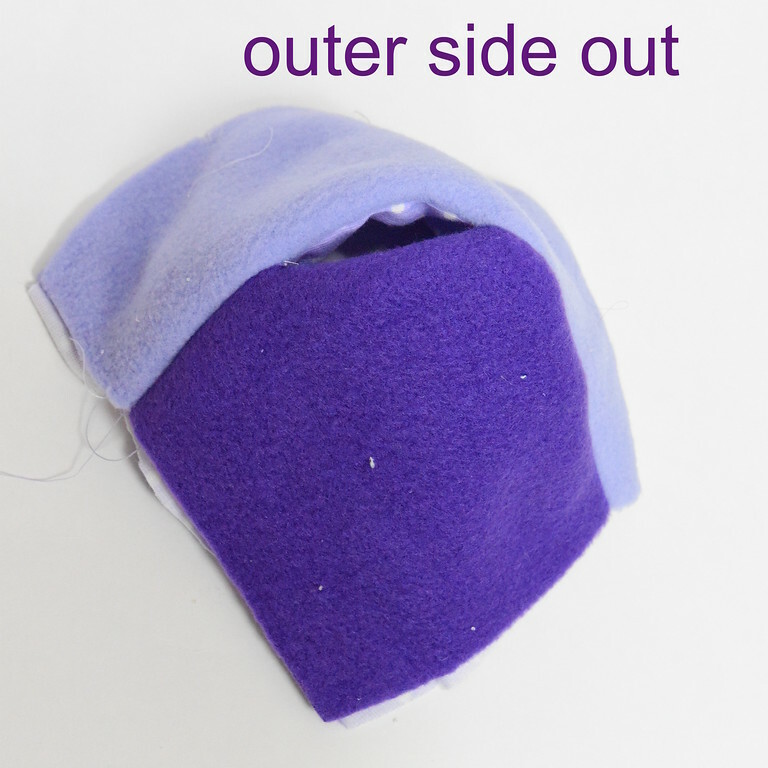 the outer hood side is joined to the outer hood top on either side of the ear opening. Step 3: Now work with the LINING pieces. 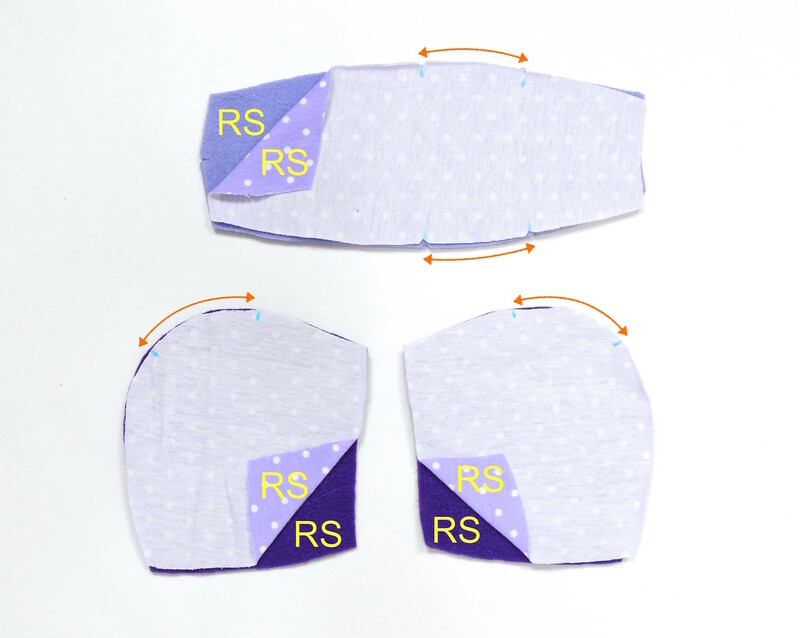 With RS together, repeat Step 2 to connect the lining pieces to EACH OTHER on either side of the ear opening seam. 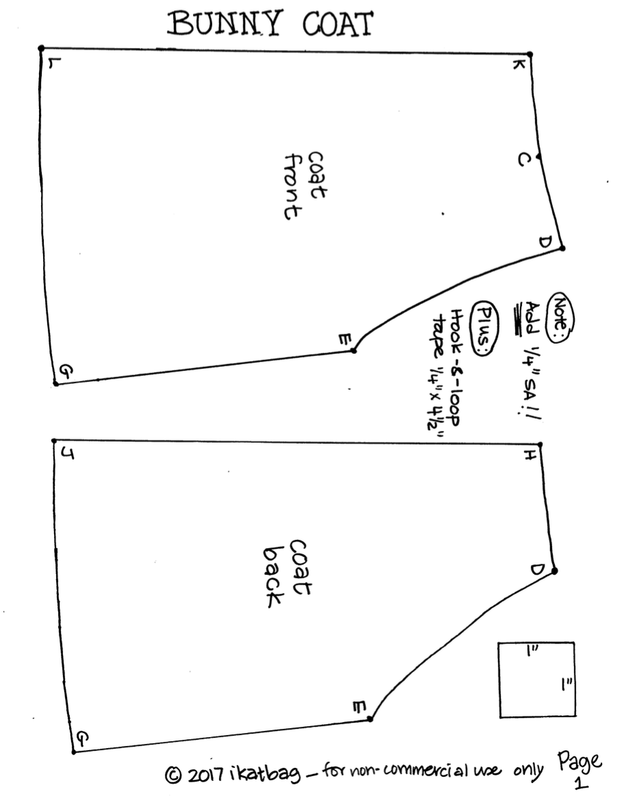 This is what that hood seam should look like from the outer side and the lining side - a beautiful slit opening. 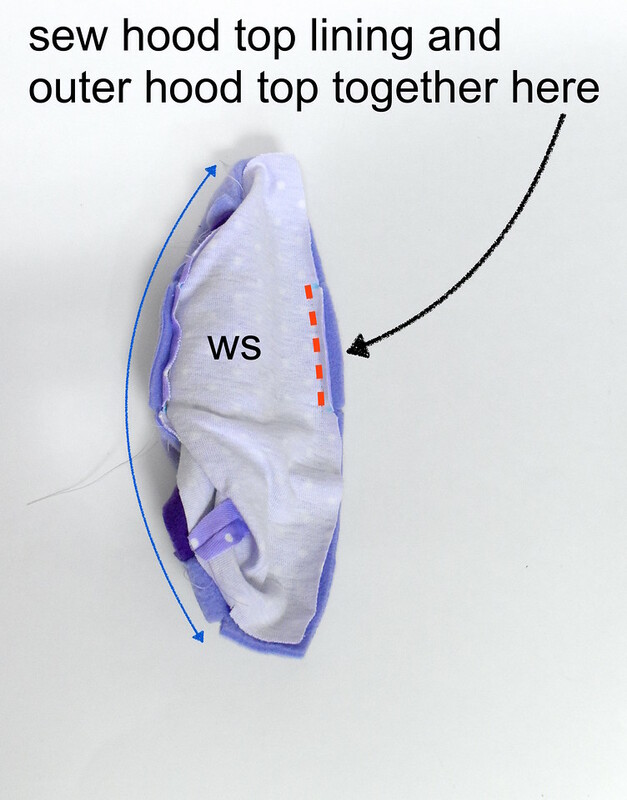 the hood side pieces are enclosed between the two long sides AB. Done right, you should get this . 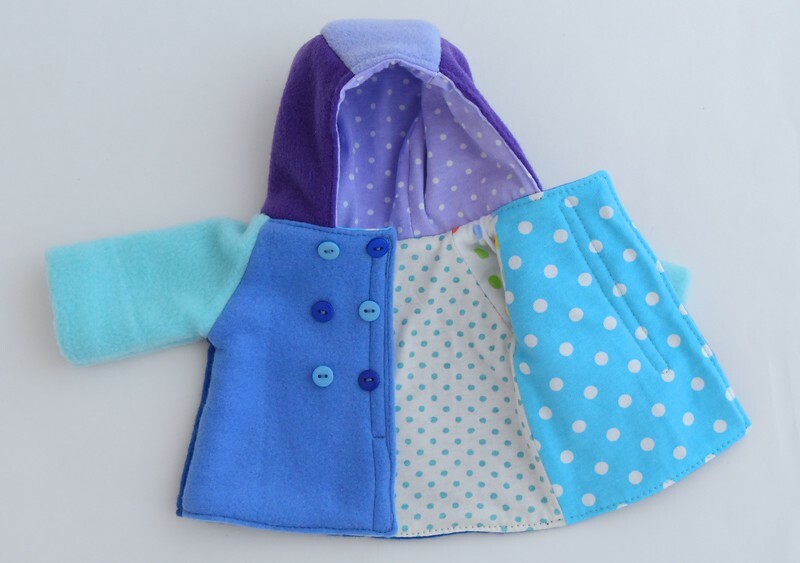 . . bundle: the hood top outer and lining pieces have their RS together AND and their other, unstitched long sides AB aligned AND the hood side pieces smooshed between them like a sandwich. 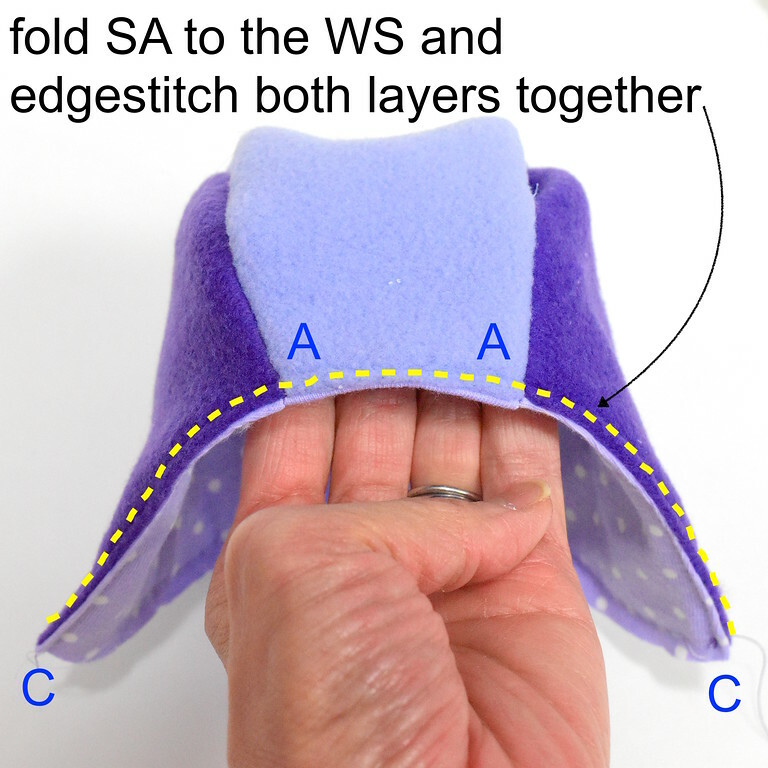 Step 5: Sew the hood top pieces together in the region of the ear opening. 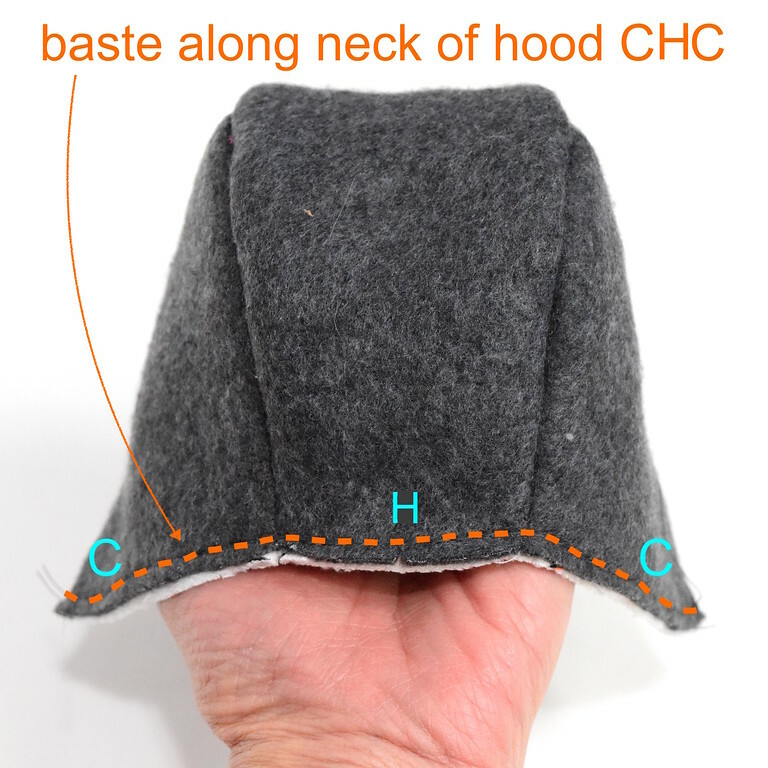 Push the enclosed hood side pieces out of the way of the seam. Turn this ridiculous mess RS out to check. The enclosed hood side pieces should pop out. Step 6: Now we're going to attach the second hood side pair. First, with RS together, sew the outer and lining hood side pieces together in the region of the ear opening. 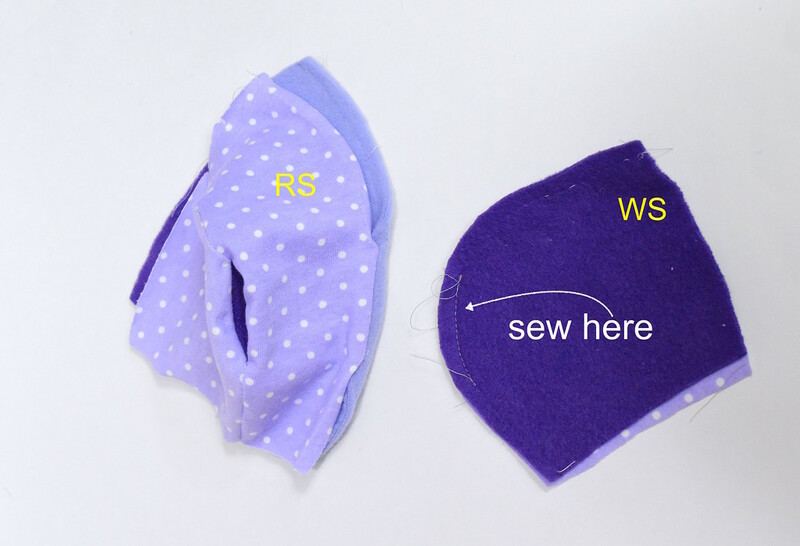 with RS together, repeat Step 3 to connect the hood side LINING to the hood top LINING on either side of the ear opening seam. When finished, you should get something conjoined-twin-esque that looks like this: two complete hoods attached to each other ONLY AT THE EAR OPENING SLITS. If you made it this far, break out a bottle of wine and some expensive dark chocolate and feast. You deserve it. Step 7: Homestretch (for the hood, anyway)! 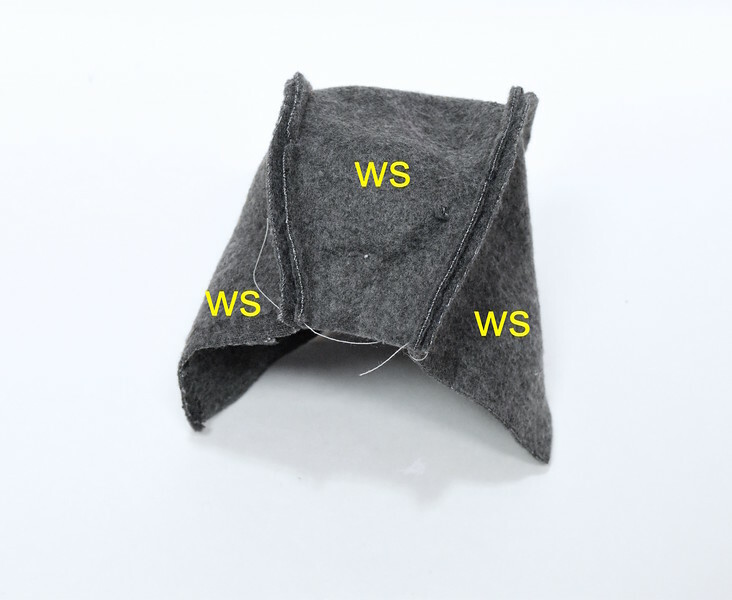 Bring the WS of the outer and lining hoods together. In the photo below, you can see the ear openings - no exposed SA! We'll finish the front opening (which frames the face) now. 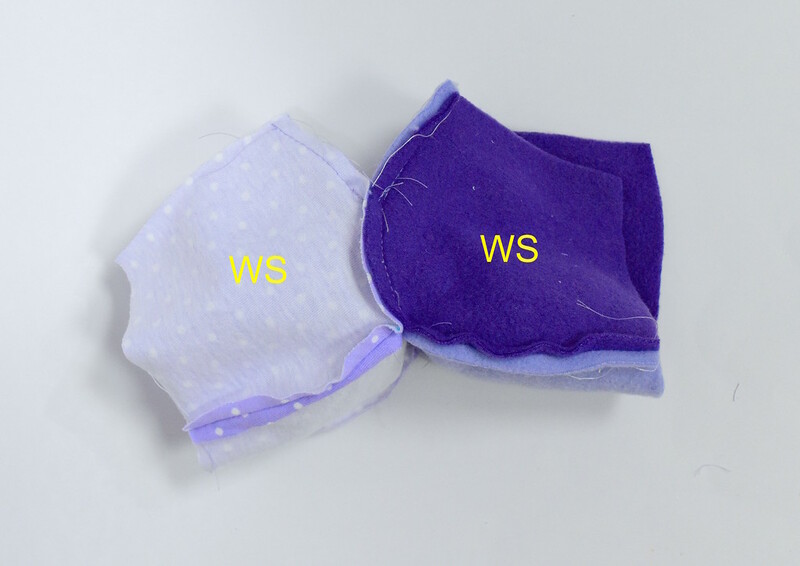 Fold the SA of the edge CAAC of both layers to the WS and edge-stitch through all layers. Flip the hood around and baste the SA of the layers together along the edge CHC. This is the edge that will be sewn to the neckline of the coat. My lining layer sticks out beyond the outer layer because I pulled it taut. 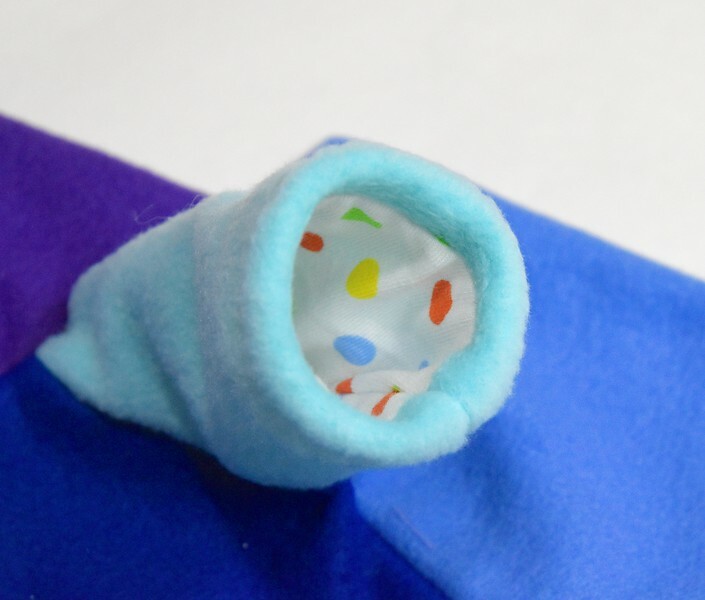 You can trim off any uneven SA if you want to (I just left mine as is, since it gets inserted into the neck seam anyway). The hood is finished! Brava!!!! Continue to Part 2 for more acrobatic tailoring as we sew the body of the coat. See you back in a day or so! Belief is the best part of trying something new. 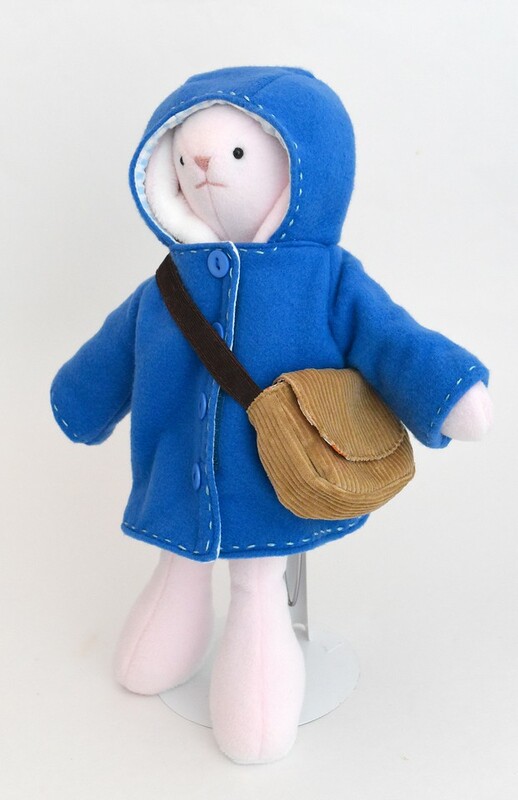 Can't wait to make this coat! Wow! Acrobatic tailoring indeed! Thank you so much for this tutorial & all of them. I look forward to your emails & posts even when you are not giving a tutorial it is fun to read about all of your adventures! Have a blessed Christmas & New Year.